River Deele and the bridge. Not much to add, here...the original Wood Anemone bud that I've been following has now opened, but the flower is the worse for wear given a few frosty nights. There are plenty more that have nearly caught up, even though they were not above ground when this one first showed. I could look at a picture like this for ages. Ripening capsules of Mnium hornum, a moss. The back-light makes me wonder if mosses use the capsules as light focussing lenses to get more sunlight deep into the plant - those downward pointing lenses aim straight at the inner plant. 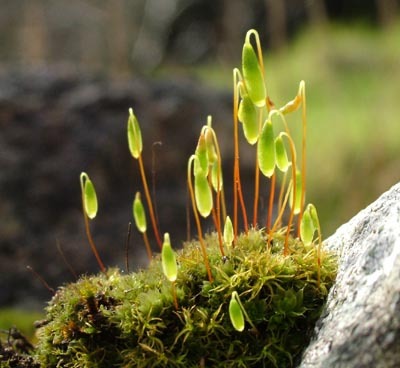 Other mosses appear to use the capsule stalks as light pipes for the same purpose. This blue/grey crustose lichen - Porpidia tuberculosa - is not one that I usually see. Specimen about 8 cm across. I'm going to take a look at micro-moths this year. They are little (1 cm. or so) moths that can be very difficult to identify.....but I like a challenge. This one is Endrosis sarcitrella - the White Shouldered House. It is mostly found indoors. This one was on the inside of my south facing window. About 8mm. long.